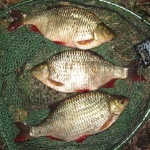 I'm going to have a dabble myself this season, any of you guys know of a pair of suitable rods around 1.75 tc for sale? Ta. I always said southerners had it easy. Back in the day up here you're ears would prick up at a 15 pounder and twenties were a dream. Nowadays a 20 is on the cards and it's a thirty which makes your ears prick up. It really was grim up north! I bet you put eight pound tench back without a photograph too. Like I keep telling you boy..........................................there is nothing wrong with me.......................its everyone else. A brother from another mother perhaps? I can’t wait to re introduce them to each other . I'm currently thinking about having an early season trip to the Fens for a spot of Tench fishing with my little lad. The Ball n Chain wouldn't let me take him last year because he was only 7. I used to get bottles of wormz, liquid worms extract. It stank to high heaven and if I was knocking groundbait up on a Sunday morning after a heavy session on a Saturday, I'd be baulking my guts inside out, it did seem to pull the bream and tench in though! Never seen it for years???? I need some worms so will order some of the liquids too and report back. Ferment a bucket of hemp, maggot, corn and caster for 24hr......nice ! Better still, forget about it for a fortnight. It was my first day tenching this year, a cool easterly wind seemed to put them down and I had a day of contemplation instead. Still it gave me chance to get my act together and iron out my rusty methods and casting abilities. I remember the old liquid worm mix that was available and it stunk, also it was a bugger to get off your clothes and hands afterwards... but still its probably worth a try. Cheers, I’ll stick with a kilo for now and see how long they last. Less than a week till my first trip to Bawburgh now, hugely excited! Nice misty morning, any tench ? Nope, saw a few around me but they didn’t fancy my baits! Turned cold this morning. Next time! First session for me on syndicate today in six degrees and easterly wind, boilie on one rod corn on another and tried different natural baits on third, not a sniff all day! Won’t be going back until that wind changes!